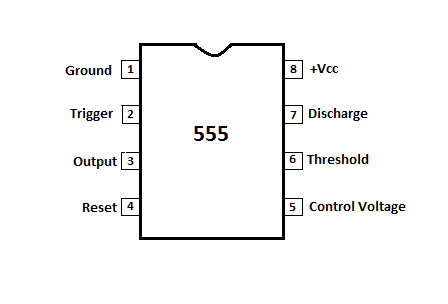 The 555 is a monolithic timing circuit that can produce accurate and highly stable time delays or oscillations. It is one of the most versatile linear integrated circuits. Signetics Corporation first introduced this device as the SE/NE 555 in early 1970. The 555 timer basically operates in one of he two modes either as Monostable (one-shot) multivibrator or as an Astable (free running) multivibrator. The device is available as an 8 pin metal can, an 8 pin mini DIP or a 14 pin DIP. The SE555 is designed for the operating temperature range from -55 to +125 degree Celsius, while the NE555 operates over a temperature range of 0 to +70 degree Celsius. It has a high current output sinking or sourcing, 200mA of load current. 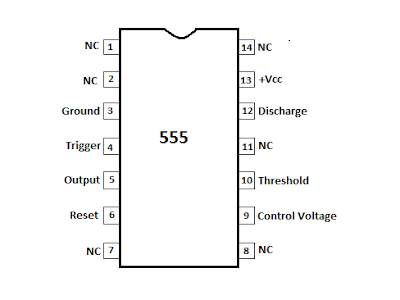 The output of 555 is capable to drive TTL logic. It has a temperature stability of 50 parts per million(PPM) per Degree Celsius change in temperature. It has a variable Duty Cycle. Its trigger and reset inputs are logic compatible. 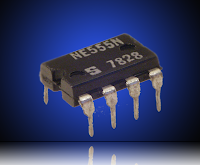 The 555 timer IC consists of about 23 transistors, 2 diodes and 16 resistors. All voltages are measured with respect to this terminal. It is the inverting input to the comparator, that is responsible for Flip-Flop to Set or Reset. The output of the timer depends on the amplitude of the external trigger pulse applied to this pin. The output remains high as long as the trigger terminal is held at a low voltage. Output of the timer is available at this pin. The load connected between pin3 and supply pin is called the normally on load and that connected between pin3 and ground pin is called the normally off load. To disable or reset the timer a negative pulse is applied to this pin due to which it is referred to as reset pin. When this terminal is not to be used for reset purpose, it should be connected to +Vcc to avoid any possibility of false triggering. The function of this terminal is to control the threshold and trigger levels. The external voltage applied to this pin can also be used to modulate the output waveform. This is the non-inverting input terminal of comparator, which compares the voltage applied to this terminal with a reference voltage of 2/3 Vcc. This pin is connected internally to the collector of transistor and mostly a capacitor is connected between this terminal and ground. A supply voltage of +5V to +18V is applied to this terminal with respect to ground. Can be used as Monostable or Astable Multivibrator. Used in Digital Logic Probes. Used as Wave -form generators. Used in Temperature measurements and control devices. Used for Burglar and Toxic Gas alarms. Used to create some time delays. I have just started working with the 555 IC and have a few questions please. 1) the output is compatible with CMOS & DTL? 2) Trigger & Reset Inputs are logic compatible? 3) Output can be operated Normal on & Normal off? 4) Voltage Output can sink or source?